Sports cards are a math teacher's gold mine. Math facts to add, subtract, multiply, and divide. Decimal places to round off. And more! A single card limits the physical size of material that requires examination. A single card induces less student anxiety than a textbook page or chapter. It also provides immediate opportunity for a teacher’s evaluation of student function along the problem-solving continuum from a limited or one-step through to a series or multi-steps. Examine the uniform numbering on your favorite team. * How many different places is the number printed? Why would the number be repeated? From information you find on the cards of two players, list the strengths and weaknesses of each. 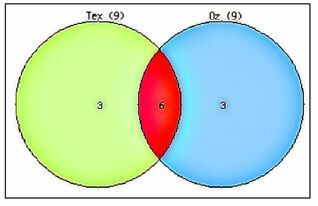 Use a Venn diagram to compare the players using your lists. Create a team from cards so that each card represents one player position. This is even more fun if the players are from different teams. * For this team, calculate the average height, weight, and age of the players. * Demonstrate these on a graph or your choice. * Use the graph to compare your team with other teams. 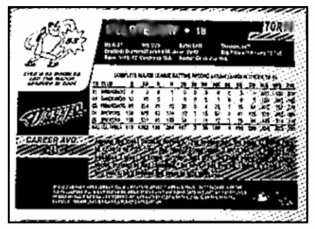 Once students are able to find information they need from sports cards and they can “play” or manipulate the information in different ways, you can use the cards and their content as springboards into related mathematical study for other parts of your course. Keep the encounter short and productive. When you achieve your teaching objective, call it quits and collect the cards in a shoebox. Use this power only for Good! 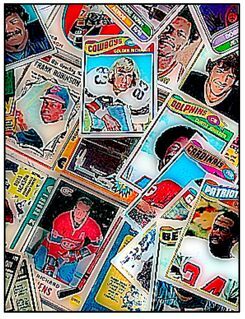 Return from Teaching Sports Card Mathematics to Sports Cards hub page for even more sports card teaching ideas! Jump from Teaching Sports Card Mathematics over to the Menu Budget page for a serving of financial activities! Return from Teaching Sports Card Mathematics to Real World Content Advantage home page.